These 10mm and 12mm equivalent 1/144th scale aircraft are pretty much all from kits, or from the Takara ready-made Storch or the equally remarkable ready made Doyusha Stuka range. It's been years since I've built plastic kits, and in general I found Minicraft kits very easy to make. 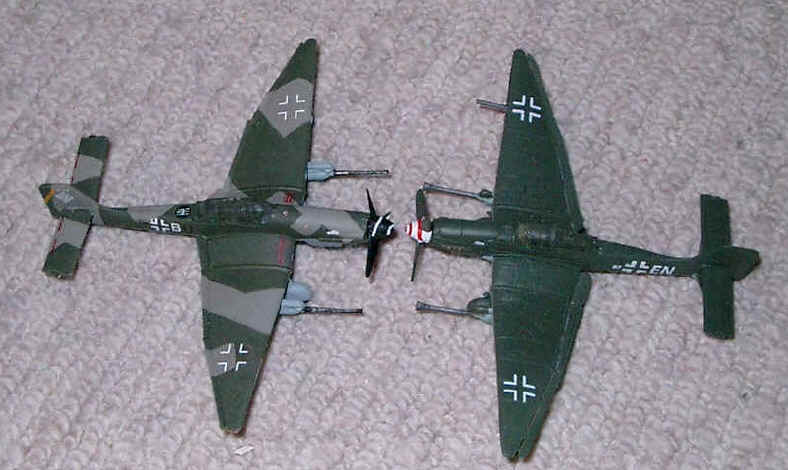 The Eduard Stuka however was an entirely different kettle of fish - I would have found this tough in 1/35nd scale, so 1/144 was very very fiddly indeed. I have drilled holes in the bottom of them all to mount them on stands using 0.32 brass or metal rods. For the small ones the wire just goes inside the aircraft and it stays stable with little or no problem. For the large aircraft (the B25 and Dakota) I sliced up a plastic sleeve from a paintbrush, taped it back together again so it was a bit narrower and cut a hole in the bottom of the aircraft to glue it into. I then have a stand for these 2 aircraft with a much thicker (1/16th inch) brass rod and a larger base as well for more stability. I got the kits from Hannants shop in Colindale, however they also do mail order - the Doyushas were from eBay, but you can buy them from tankzone also. Minifigs, Pendraken and Skytrex all do aircraft, and for totally obscure ones from True North in the US. 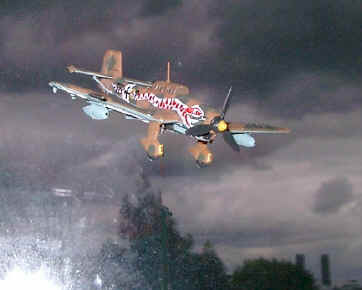 Doyusha Stuka 1/144 scale - Ju 87R-2 Tropical 6./St.G 2, Tmimi, Libya, July 1941 on a stormy night. Real sky, with the wire the model is mounted on being erased away with MS Image Composer. 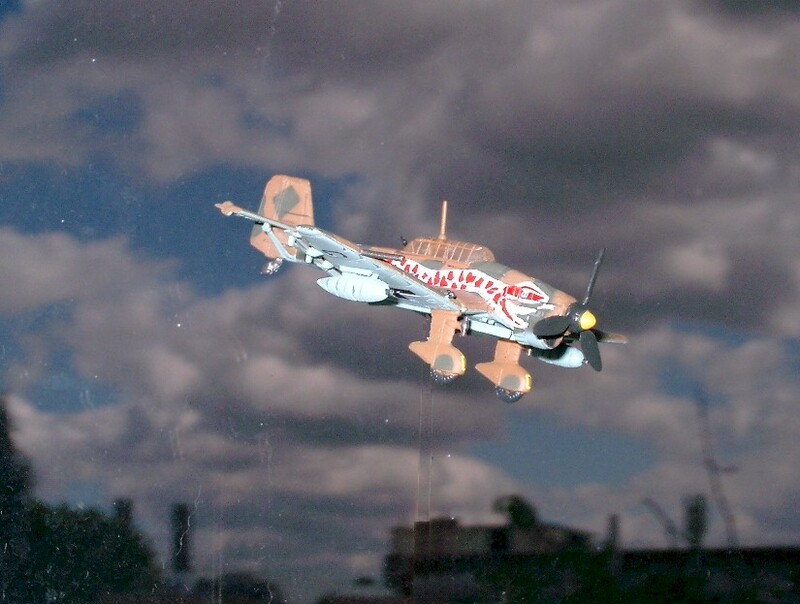 The Stuka screams away through the evening sky as the explosion of its bombs lights up the rooftops below. The "explosion" is actually an accidental reflection on my window as I used the flash on my camera - but I think it looks kinda cool ! 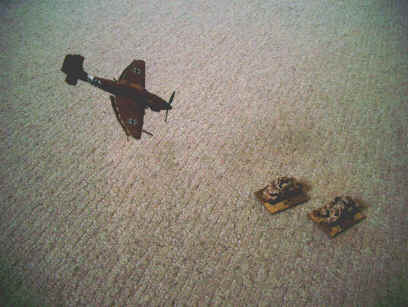 Eduard vs Doyusha Stukas (Edouard on the left). Eduard Foke-Wulf 190. The unit markings are a mix of those from the 2 provided, as the transfers were very delicate (i.e. I broke some putting them one). Other than the transfers however, very easy to make! Hurricane from the "Sweet" range These seem expensive until you realise there are two in each box ! Takara ready-made Red Nose Me109. A very detailed little kit, even the props move, and it is supplied with separate bits so you can have the wheels up or down. 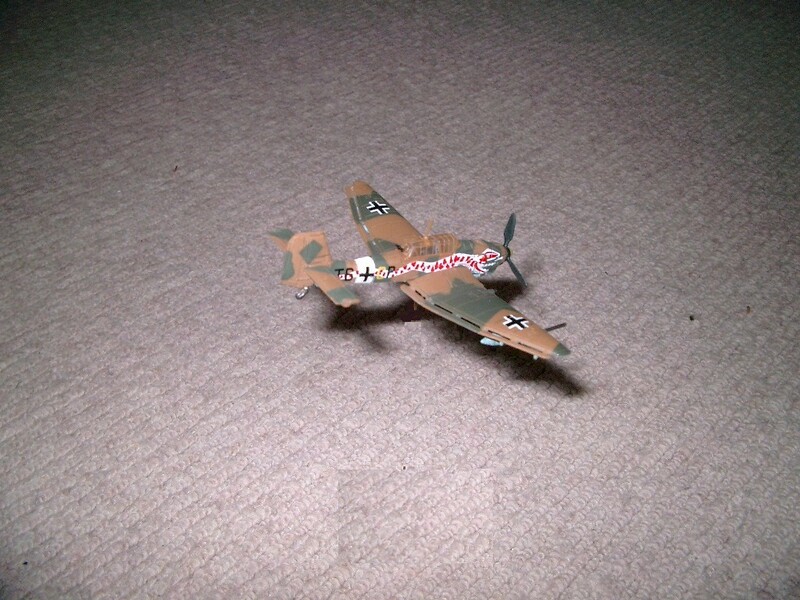 The stand is also included, and is OK for low level ground attack.